...this is an immensely appealing introduction to this magician chef who is able to transform even the most pedestrian fare into a mesmerizing everyday feast. 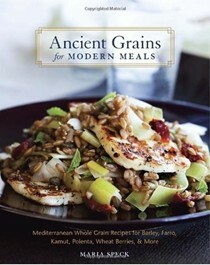 Maria has a lifelong passion for the subtle flavors and rich textures of whole grains. She grew up in Greece and Germany before moving to the US in 1993—this unusual heritage is at the center of her cooking, writing, and teaching. Maria’s recipes are inspired by the ease and appeal of Mediterranean cuisine and the centuries-old traditions of preparing whole grain foods in Northern Europe. 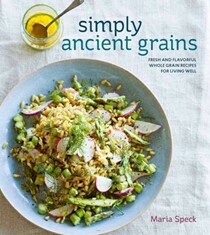 She combines her vast knowledge about cooking and baking with whole grains with a keen understanding of how to transform these ancient staples into quick and modern foods for our time-strapped lives. 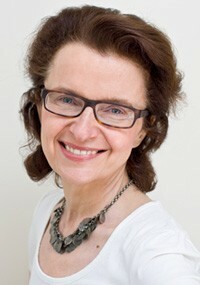 Maria teaches at the Cambridge School of Culinary Arts (CSCA). In her food writing, Maria combines more than two decades of journalistic research, editing and reporting with her lifelong passion for food. She started her career at Germany’s leading news agency Deutsche Presse Agentur (DPA), and she came to the US as a Knight Fellow at Stanford University. Since then, she has worked as a freelance writer for US and German magazines. In the US, Maria has contributed to Gourmet magazine, Saveur, Gastronomica, the Vegetarian Times and Cooking Club, the publication of the Cooking Club of America among others. In Germany, Maria’s stories have been published in the country’s leading magazines and newspapers, including the news and lifestyle publication STERN which sells one million copies a week, SPIEGEL online and BRIGITTE, the country’s prestigious women’s magazine. Maria is a member of the International Association of Culinary Professionals (IACP), Chefs Collaborative, Les Dames d’Escoffier, The Culinary Guild of New England, and Slow Food USA.